I spent today working on a handy color chart that you can use to coordinate your fabrics for the upcoming Quilt-Along. We know you have all have our Rotary Cut Applique tools sitting in your workroom. So let's get them out and start using them! 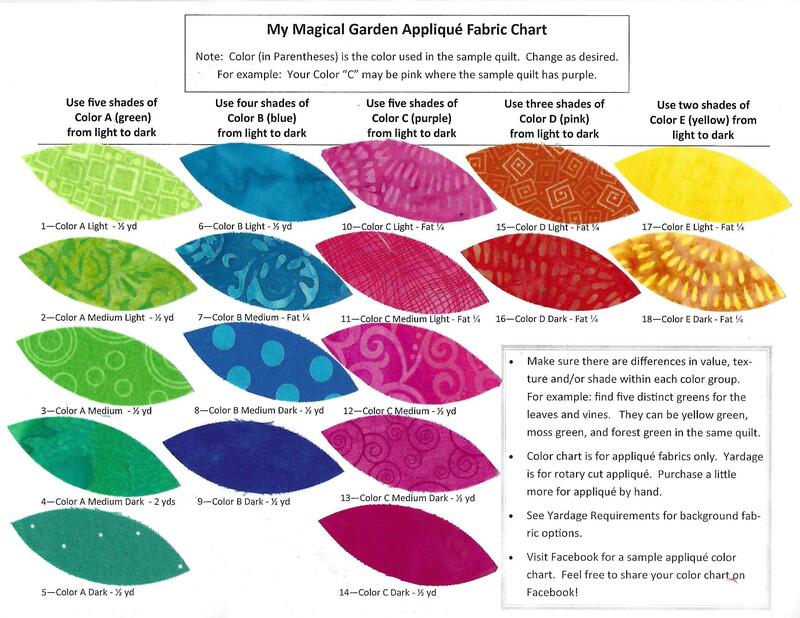 The new Magical Garden Facebook Page is up and running, and that is where Joanne posted her Color Chart that she has just finished for her version of the "My Magical Garden" quilt. Whether or not you are participating in the BOM this year, sign up to be part of our Facebook Group so you can see the progress of the other quilters who join in the fun. The purpose of the Quilt-Along is for you to start using your Leaves Galore and Hearts & More tools, so if they are sitting on a shelf, lets get them out to play! Don't forget, the full quilt will be revealed on January 1, along with the BOM registration. We are busy getting optional fabric kits and thread kits prepared so you can keep it simple! Of course, if you want to work from your stash, just print out the handy color chart, and start rummaging through your stash for your BOM fabrics. Lets start the new year off right by learning to use the tools you already own! I'm so excited to help you make this beautiful quilt! Hi, I am using my own batiks for the Magical Garden. I found the list of yardage requirements for the applique but, for the life of me cant' find how much of the base fabric I need., I am not piecing the foundation, just the large squares will be pieced. How much do I need, please? Hi Sue, Where can I get a copy of the chart that you used in your video for block one to get the correct count of leaves that I should cut?